Getting more life out of your refrigerator. At Junk King, we pick up many refrigerators that appeared to have died young. Here is couple of tips to help you get more life out of your refrigerator. You need a vacuum cleaner or broom, some all-purpose cleaner, and a level. Step 1: Clean the condenser coils. The coils are either behind the refrigerator or underneath the refrigerator. If the coils are underneath, remove the grill at the bottom front of the fridge. If the coils are behind, pull the unit from the wall. 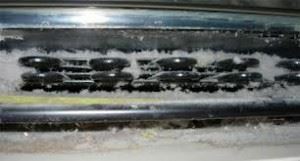 Dirty condenser coils put a strain on the motor, which costs more in energy and shortens the life of the fridge. Use a vacuum or broom to remove dust build up from the coils every three months. Step 2: Check and clean the gaskets. Clean gaskets last longer. Clean the gasket with an all-purpose cleaner, and wipe dry. Wipe the gaskets with vinegar to deter mildew. Step 3: Check for level. Eventually, your refrigerator will give up the ghost, and Junk King will be ready to take your refrigerator and recycle it for you. This entry was posted in Debris Removal, Fairfax Junk Removal, Junk Hauling, Junk King Fairfax, Recycle on May 20, 2014 by Alex Powers. Last updated August 4, 2017 .